Add color to your life with Colore Chalk Marker! Tired of messy board makers and chalk dust which course you these common problems? Add Color To Your Life With Colore Chalk Marker! Tired of messy board makers and chalk dust which course you these common problems? - Dust from using traditional chalk which often leads to respiratory problems. - Abrasive traditional chalk that leaves coarse and unsightly markings on the chalkboard. - Faint color that fades with regular use. - Stains in pockets of your clothing as a result of carrying chalk. - Chalk that is not ideal for kids because of the dust and stain markings. Well, this should not happen anymore! 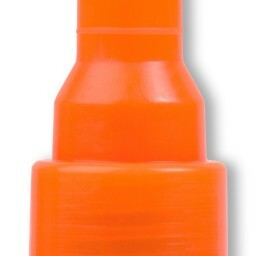 - Colore Chalk Marker is available as a fine 6mm tip liquid fluorescent marker. Allowing users to make use well-defined lines and prevents smudging. - It features a white metallic interchangeable tip, chisel and bullet point which makes it easy to use. - They are available in 8 vivid colors including purple, white, blue, yellow, orange, pink, red and green. 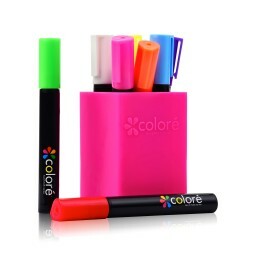 - FREE GIFT: Colore Chalk Marker comes with One Silicone Pen Holder, color of pen holder varies (pink, yellow, green, blue, orange). IMPORTANT NOTE: Use Colore Chalk Markers on non-porous surfaces. Not suitable on most chalkboards, because of it's porous surfaces. Test on a small area first to see if it wipes off, before continuing on your project. Colore Chalk Marker can be used in different setups and is ideal for use in learning institutions, offices, craft centers, art works and decoration work just to mention a few. 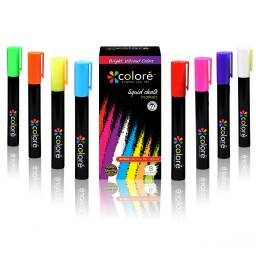 Colore http://www.coloreart.com is promoting their Chalk Markers By Colore - 6mm Bullet/Chisel Tip - 8 Pack Bright Vibrant Colors. 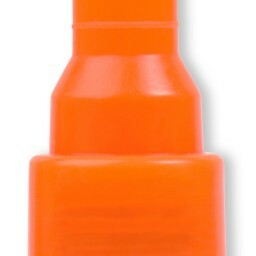 Visit product page http://www.amazon.com/Chalk-Markers-By-Colore-Vibrant/dp/B00PJEY0MG and find out more. #chalkmarkers I have to say I really love these chalk markers! They have really brightened up my life! @Coloreart let me try its #chalkmarkers for a #productreview. bit.ly/1LmoKcf Had some fun and got my hands messy. Read my review on my blog (link in bio) about these super cool #chalkmarkers you will love them!! !